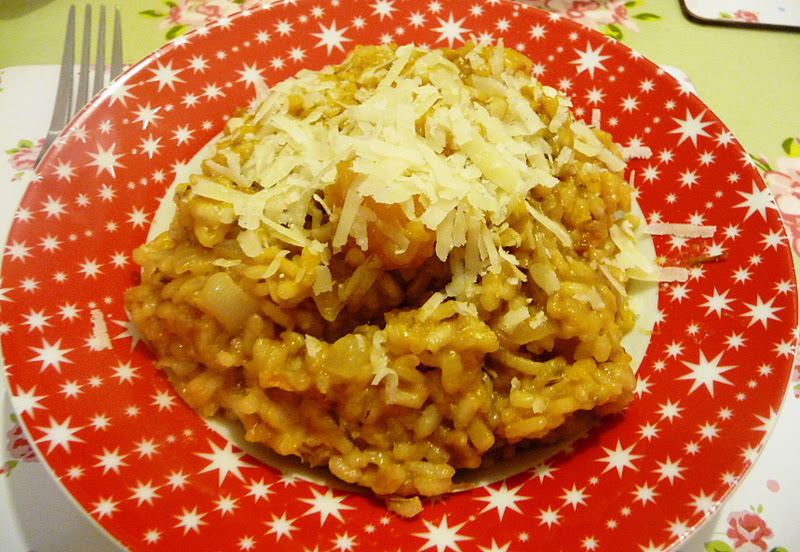 The Vegetarian Experience: Pumpkin Risotto- "Risotto di Zucca"
As Thanksgiving is almost upon my American Counterparts, I thought that it was time to crack open our pumpkin which we were given over Halloween. Not being one to celebrate Halloween, I tend to associate pumpkin more with Thanksgiving and cooking than with a Jack O'Lantern. Pumpkin is a versatile cooking ingredient and is very low in fat. It is also very economical. Cutting the pumpkin took me over an hour as it was so big. I will easily have enough pumpkin pieces to cook three different dishes, so stay tuned for more pumpkin recipes this week. 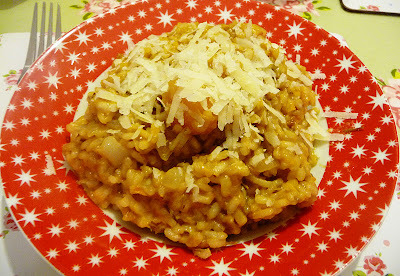 I thought I would kick off my pumpkin recipe series with Pumpkin Risotto. 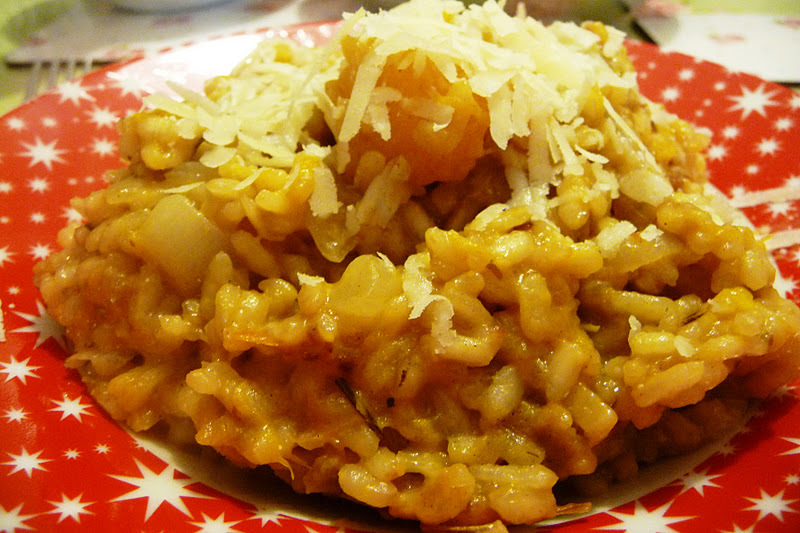 I went to a friend's wedding in Scotland this year and the hotel served the most amazing pumpkin risotto as part of the vegetarian choice for the wedding breakfast and so whenever I eat pumpkin risotto, it remind me of our friends lovely wedding. 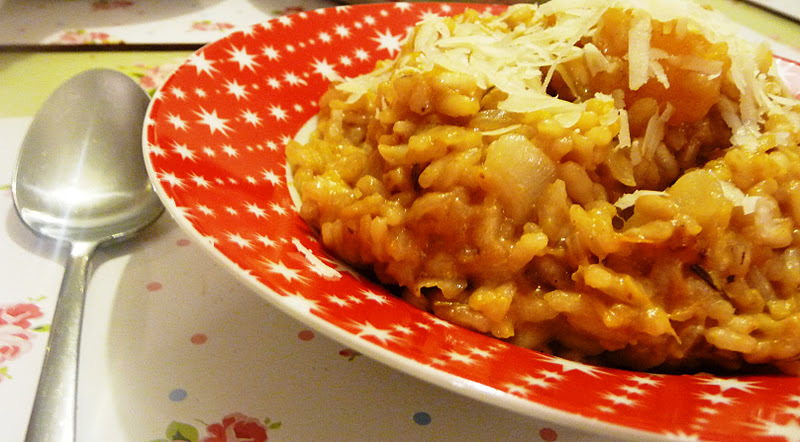 This Pumpkin Risotto is based on a recipe by Antonio Carluccio. The original recipe calls for parmesan, which is not strictly vegetarian as I am well aware, so I substituted it for Italian Hard Cheese in this dish. Heat the oil, plus a third of the butter, and then add the pumpkin, rosemary and garlic clove to the pan. Heat for about 20 minutes or until the pumpkin softens and dissolves. Remove the garlic and rosemary sprigs. (I used dried so left the rosemary in). In a different pan, heat another third of the butter and gently fry the onion until softened. Next, add the rice and fry gently again for a few minutes, stirring continuously. Gradually add the pumpkin mix and then a little of the vegetable stock. Add more stock a little at a time and let the stock be absorbed by the rice before adding more. Stir to avoid the mixture sticking to the pan. 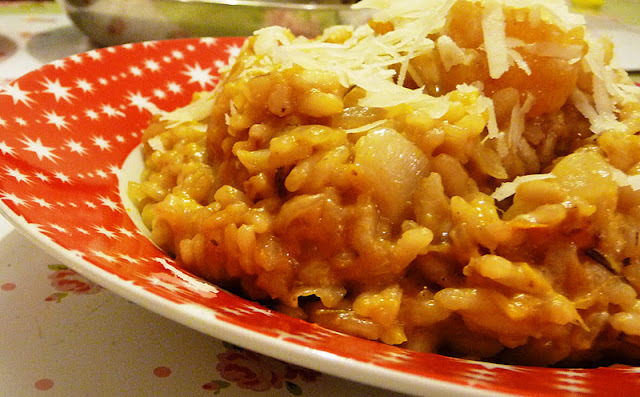 Once the rice is cooked, remove from the heat, add the remaining butter and two thirds of the Italian hard cheese and stir. Sprinkle more cheese over the top and serve immediately. This looks so hearty and amazing! Its nice that you associate it with a lovely memory too!